PFF5-303 is an eccentric bush for the M3 or where increased caster is required. 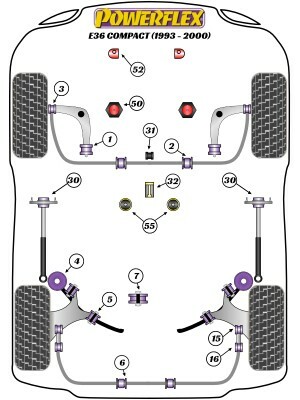 PFF5-304 is designed to fit models where the Anti Roll Bar joins lower arm not the shock absorber. For the rear trailing arm use either PFR5-306 or on-car adjustable bushes PFR5-306G. PFR5-5630-10 fits cars with standard or aftermarket rear shock absorber with a 10mm pin, PFR5-5630-12 fits cars with aftermarket rear shock absorbers with a 12mm pin.